We are a homeschool program developed by veteran homeschool moms. We offer classes one morning a week for 3 hours. We hope to bring more classes to our program as we grow. 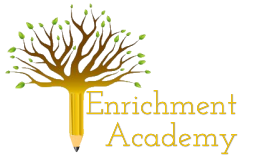 Enrichment Academy is a unique academic environment. We cater to homeschool students and children preparing to embark into the world of learning. We have experience integrating children with special needs into a small classroom environment. We are a once a week tutorial. We believe that, you, as the parent know the needs of your children and make the best decisions about their personal curriculum. We offer hands on instruction that enhances and extends the curriculum you use at home. Hands-on learning includes educational exploration in the areas of the arts, sciences, language arts, and physical education. In the 2016-2017 school year, we look forward to providing up to 3 hours of weekly direct instruction from qualified and experienced teachers. Our goal is to provide an active learning environment that inspires the love of life-long learning.